For information in Cree, click the yellow button next to the title of this page. In the recording, the speaker is Coordinator of Pre-Hospital and Emergency Services, Jason Coonishish. 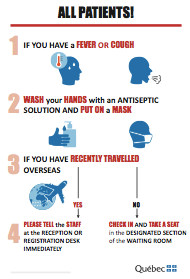 There have been NO CASES of ebola in Canada. The risk to the population of Eeyou Istchee is EXTREMELY LOW. At the same time, the Cree Health Board, in coordination with the Ministry of Health and Social Services of Quebec, IS PREPARED to deal any suspected case of the disease. The Regional Public Health Department of the CBHSSJB is leading this effort. For your safety, the poster below is being placed at the entrance of all our establishments. This poster is designed to identify any person who may be at risk. For general information contact Katherine Morrow, Coordinator of Communications (418) 770-1444. For Region 18 specific guidelines contact Dr. Kianoush Dehgahni or visit https://ccsssbj.teamworkpm.net/ (password required).